(CBS) - We rarely post random photos from Reddit, but when we do it's because we discovered something genius. This clever photo was posted today on the social bookmarking community's sub-Reddit, /r/gaming. Simply titled "She's got me figured out," the photo is of a list of chores that only a Grand Theft Auto fan could appreciate. 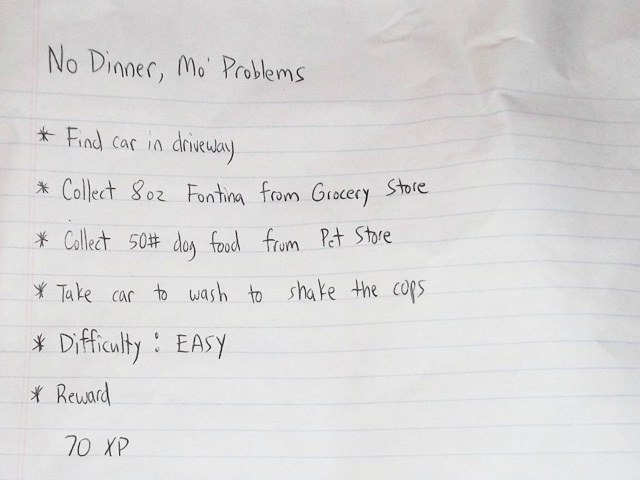 Posted by Redditor ElMangosto, the chores are from his girlfriend and written out like a GTA-style mission called "No Dinner, Mo' Problems." The list has things like, "Collect 8oz Fontina from grocery store" and "Take car to wash to shake the cops." We salute this woman for her hilarious spin on a typical to-do list. Talk about creative communication. Hey, ElMangosto. We hope you finished your mission because the reward seems pretty awesome.